Located at the western most point of Mongolia, this park on the border of both Russia and China has views of Kazakhstan from the highest peak of Tavan Bogd Mountains (“Five Sacred” in Mongolian). 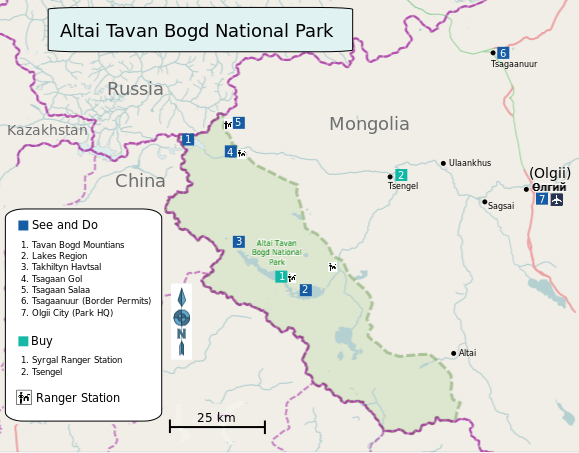 At the northwest end of this 630,000 hectare park, the Tavan Bogd Mountains contains the 5 highest mountain peaks in Mongolia, with the highest, Khuiten Uul (“Cold Peak’) at 4374 M (14,201 ft). 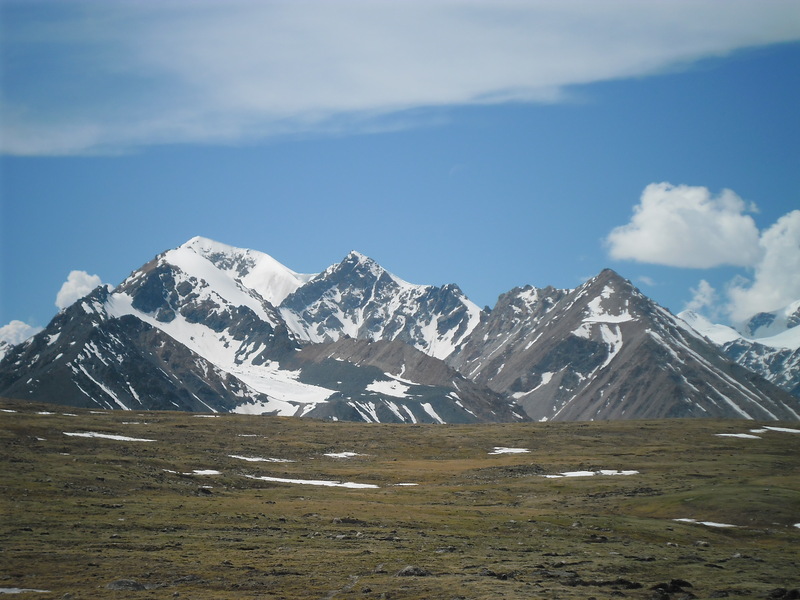 The mountains are considered sacred to local Tuvans and Kazakhs. In the shadows of the Tavan Bogd are the Pontuninii Glacier (covering 23 square kilometers) and 34 other smaller glaciers, plus several large lakes and a 10 M waterfall to the south and many archeological sites, which form the Petroglyph Complexes of the Mongolian Altai, a UNESCO World Heritage Site. The park contains the full spectrum of archeology in Bayan-Olgii with petroglyphs, standing stones, burial mounds, and Kazakh cemeteries. This biggest concentration of petroglyphs with over 10,000, which is the Tsagaan Sala site, is situated along a 15 km river valley. Another popular region of the park is the lakes region, which is renowned for its natural beauty making it much visited area by tourists and nomadic herders alike. Many eagle hunters live inside the park to hunt the plentiful wildlife during the winter months like Corsac foxes and rabbits. 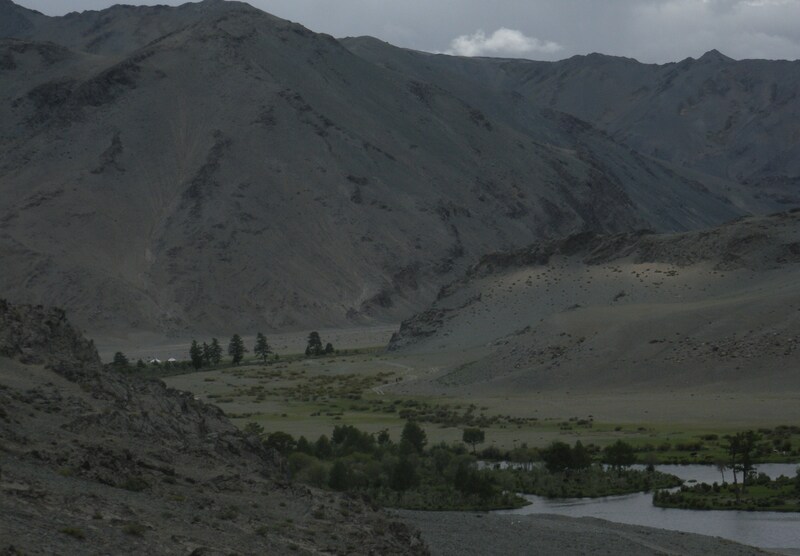 There are many endangered species inside the park including argali sheep, ibex, grey wolves, red deer, black vulture, elk, snow leopards, Altai snowcock, golden eagles, and many others. 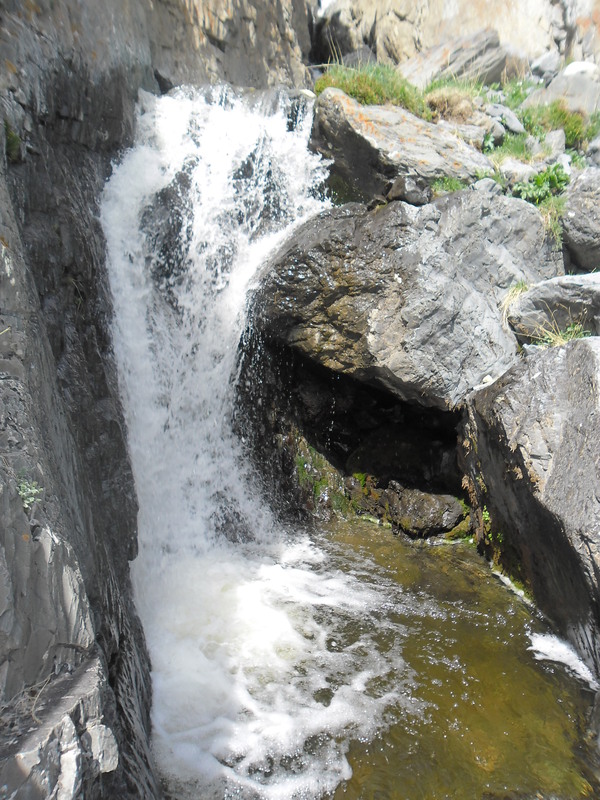 The Altai Tavan Bogd National Park is the most visited park in western Mongolia with a wide variety of activities. Mountain climbing is best during late summer when weather is warmest. 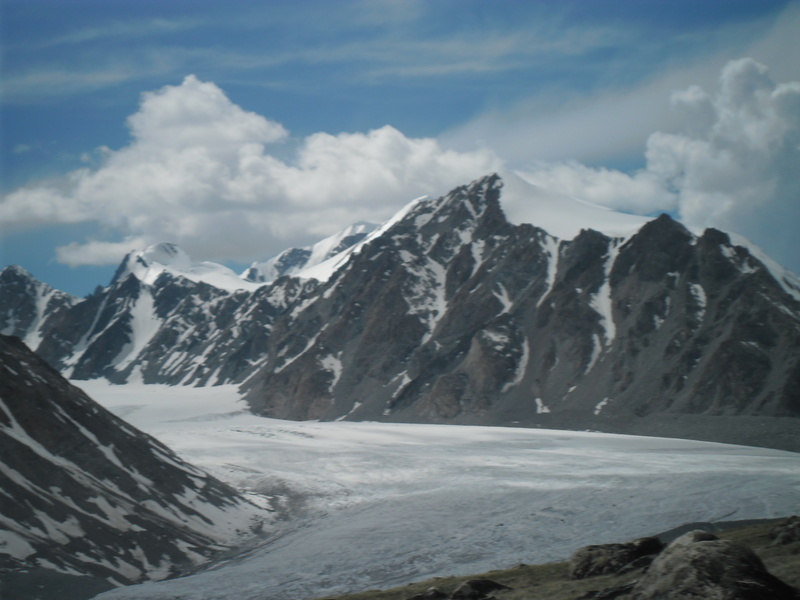 Four of the peaks require mountaineering equipment and experience climbers, though the shortest, Malchin Uul (“Herder Peak”) at 4025 M, can be hiked by novices. Near the mountains it is possible to hike Pontuninii Glacier. Hiking, fishing, mountain biking, horse and camel riding, and whitewater rafting is popular throughout the summer and autumn, with tour packages of several days or weeks available. 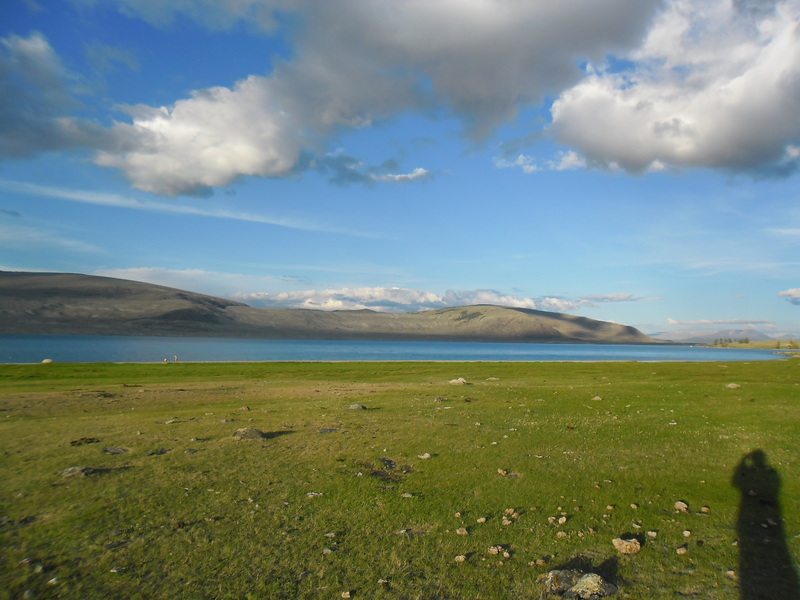 The best area to hike is around the lakes and to the Tavan Bogd Base Camp at 3092 M elevation. Tour guides can help you find the best archeological sites and to spot wildlife. Fishing is permitted in the park from mid June to April. Joining an eagle hunter with the help of a guide is available during the winter hunting season (See Tour Guides for more information). Everything except mountain climbing and rafting is available through the winter. Backcountry skiing has become increasingly popular on the Tavan Bogd Mountains during April and May when the snow is deep and fresh, though the numbers are still small. There are a few places to sleep and buy supplies inside the park. Local families have gers available to stay around the park, plus there a shop and gas station at Syrgal park ranger station between the lakes. This shop has limited stock and is not always open. Vans can be hired to drive to the park or scheduled shuttle service from either Blue Wolf or Kazakh Tours goes to the park. Blue Wolf goes on Wednesdays and Sundays during the summer months to the Tavan Bogd Mountains base camp, and from the camp on Mondays and Fridays. Kazakh Tours goes to both the Tavan Bogd North Rangers Station and the bridge at Syrgal every Sunday. Their van costs $214 divided between each passenger (up to 8) and begins June 22nd. All tour guides can arrange rides to and from different parts of the park.